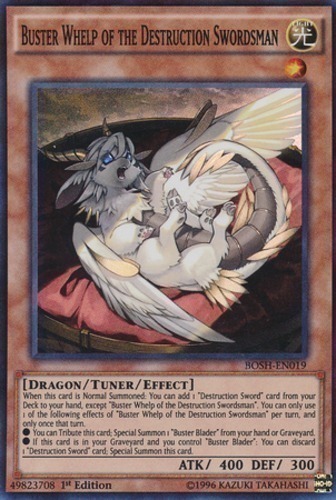 When this card is Normal Summoned: You can add 1 "Destruction Sword" card from your Deck to your hand, except "Buster Whelp of the Destruction Swordsman". You can only use 1 of the following effects of "Buster Whelp of the Destruction Swordsman" per turn, and only once that turn. ● You can Tribute this card; Special Summon 1 "Buster Blader" from your hand or Graveyard. ● If this card is in your Graveyard and you control "Buster Blader": You can discard 1 "Destruction Sword" card; Special Summon this card.